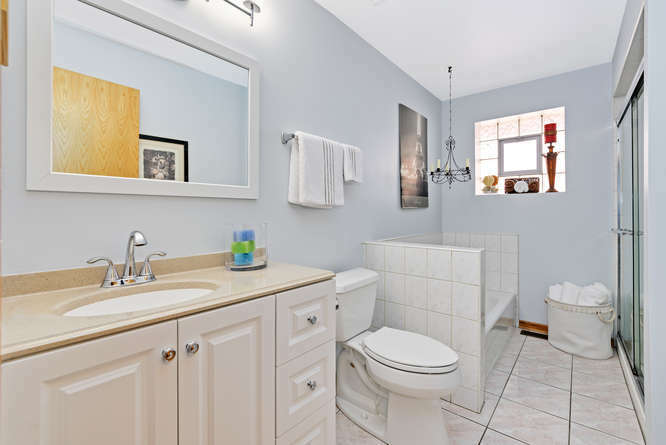 Welcome home to this meticulously maintained Bridgeport home. Notice the large evergreen trees and the landscaped front yard. This home boasts an open and airy floor plan that feels like new construction. 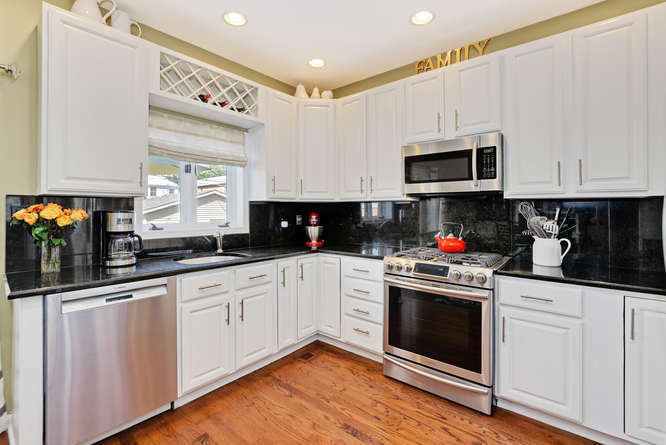 You’ll love the updated eat-in white cabinet kitchen with granite counters, granite backsplash and all stainless appliances. 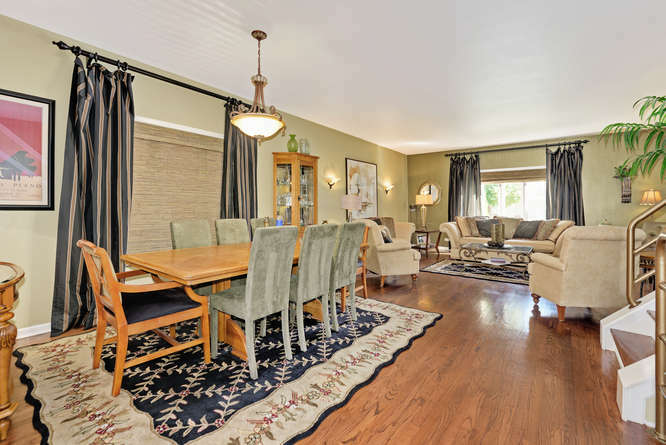 This home is great for entertaining and for everyday living. 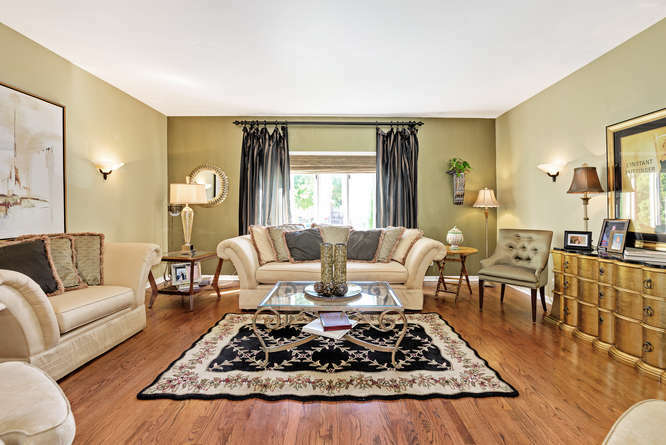 The darker stained hardwood floors greet you as you enter the home. Step up to the main living area where you’ll find the kitchen, dining and living area. Large windows throughout the main floor allow for tons of sunlight throughout the day. There are 3 bedrooms on the 2nd level. 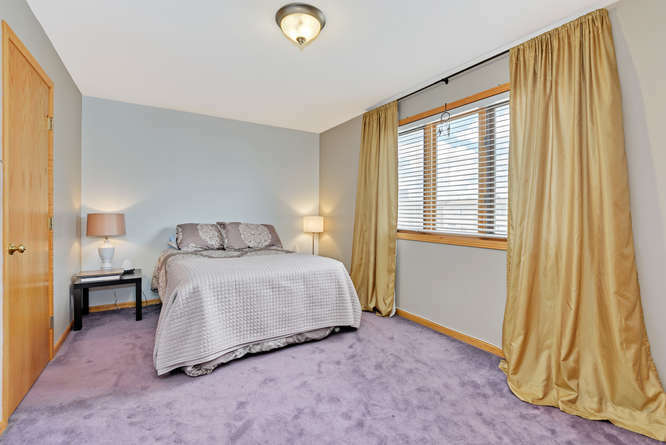 The large master bedroom has cathedral ceilings and a large window that gives you a tree top view of the street. 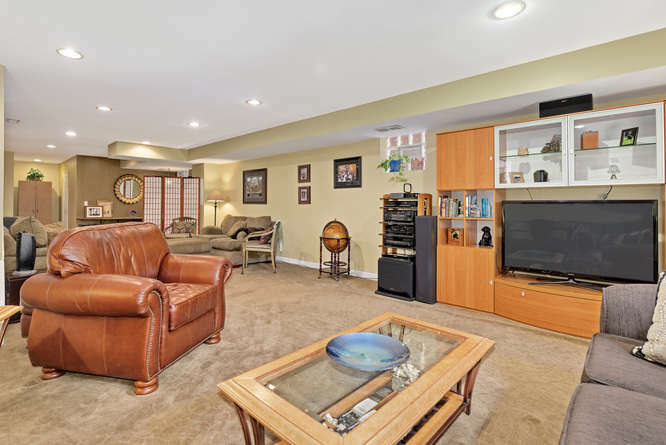 The lower level family room is huge and can be a man cave, media room, or game room. How will you use it? 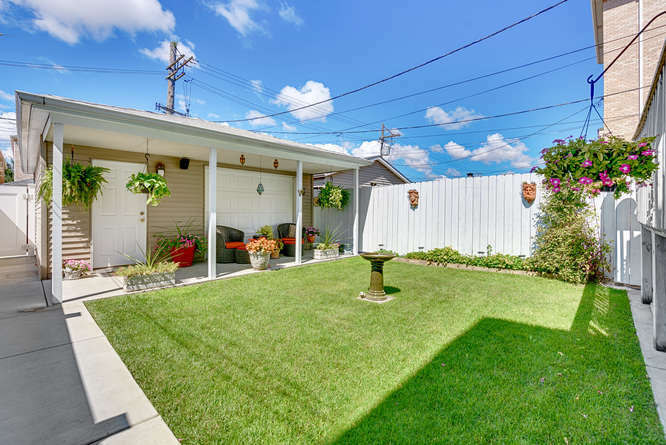 Nice back yard with a patio and a large deck for summer fun. 2 car garage. Easy on/off x-ways and public transportation. 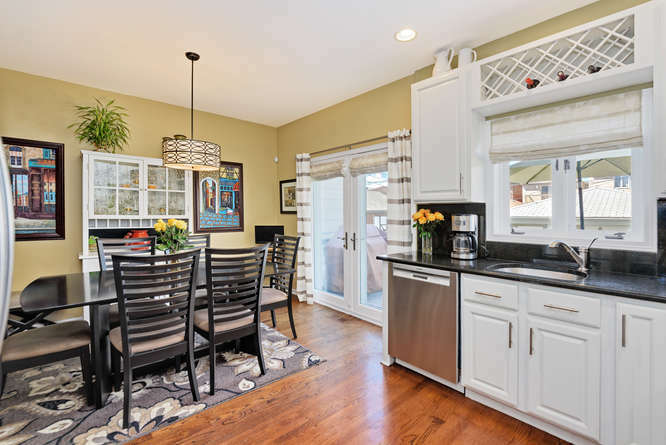 Completely updated white cabinet kitchen with hardwood floors and French Doors that lead to your large deck. 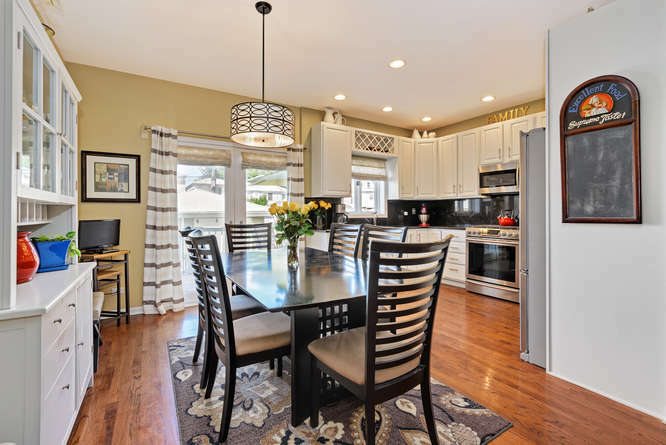 42″ white cabinetry, granite counters and backsplash are a feature in this well laid out kitchen. Large eat in kitchen. Large enough to fit a table for 6 along with a china cabinet. 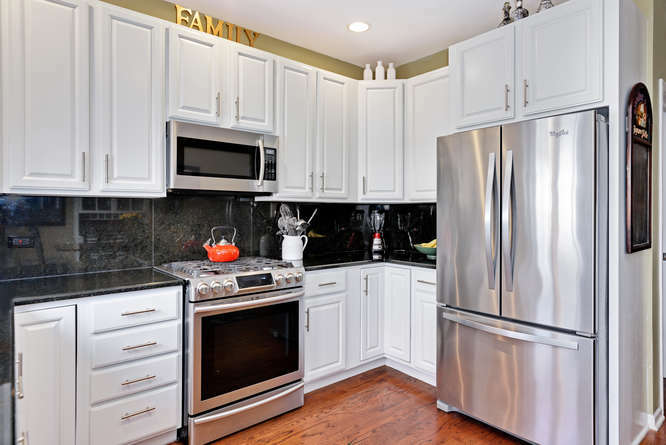 You’ll appreciate the granite backsplashes and countertops along with an all stainless kitchen. 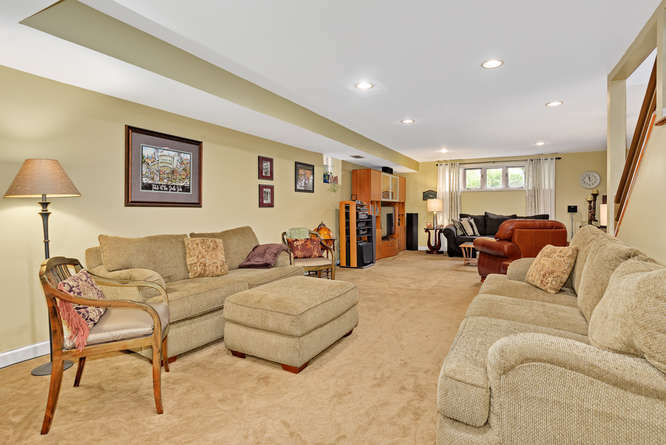 Spacious wide open floor plan that is perfect for entertaining or relaxing in the living room. 9′ ceilings and large windows add to the open feel in this room. 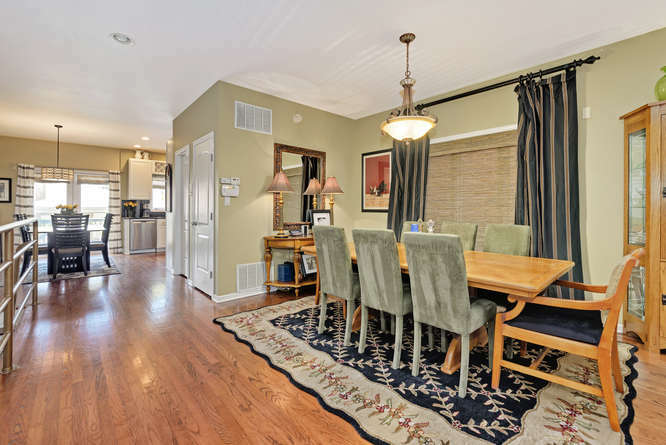 Large dining room adjacent to the living room make this a great floorplan for entertaining. Large open airy foyer that opens to the main living area. 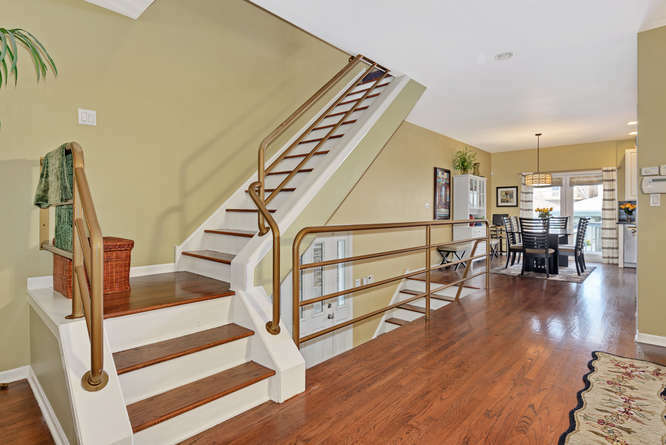 Notice the hardwood on the stairs and the white risers that lend a more updated look. The hardwood floors continue through the entire main floor. 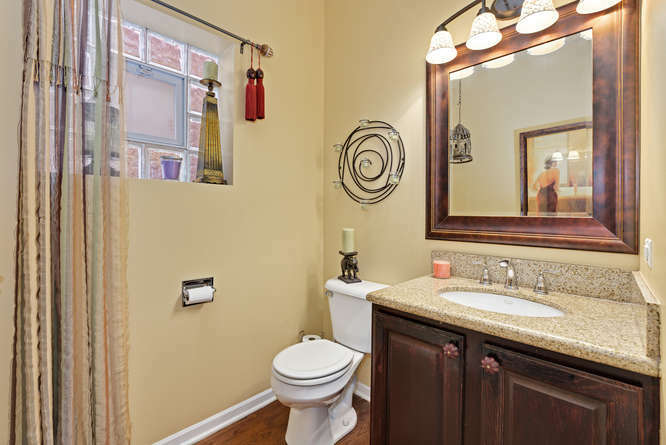 The darker stained hardwood floors and granite counter gives this powder room an elegant look. An elegant and serene retreat is what you’ll feel when you step into this room. Notice the vaulted ceilings and large window. 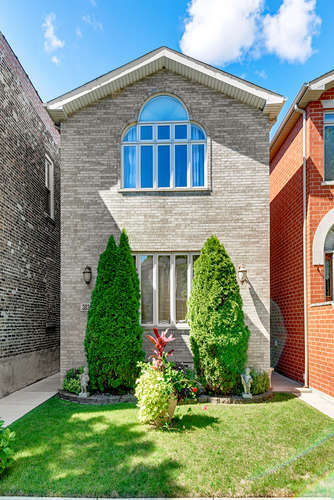 The large window gives you a beautiful tree top view of the street. This room is truly a place to relax. 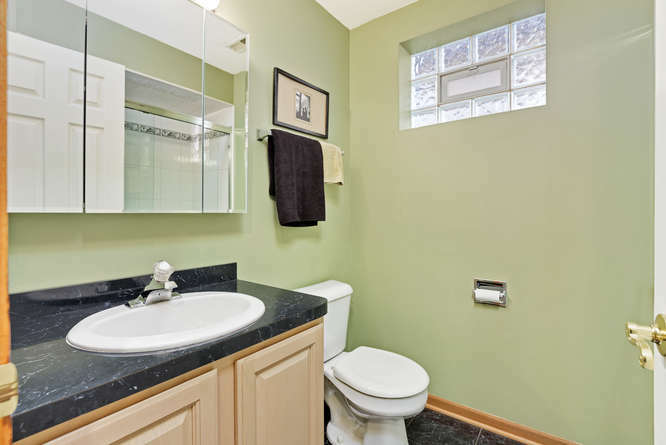 Updated sleek bathroom that also has a separate walk in shower. Look at the size of this 2nd bedroom. Large enough for a king size bed and large furniture. You’ll appreciate the large windows that allow the sun to stream in and the large closets for tons of storage. 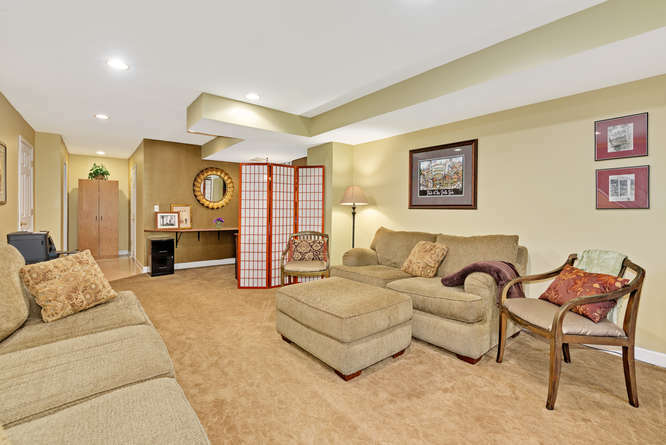 Massive family room that is currently being used as a tv entertainment area. 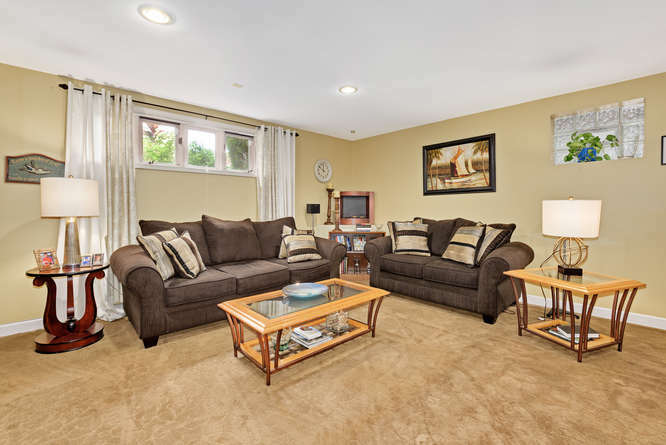 TV entertainment room, playroom, additional living space. You decide. Large enough for two sets of sofas and an office. 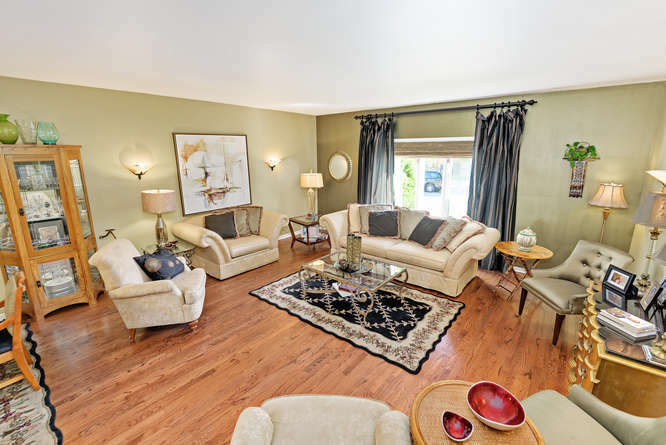 You’ll appreciate this spotless home and the ability for you to move right in. Sleek bathroom that also has a full walk in shower. 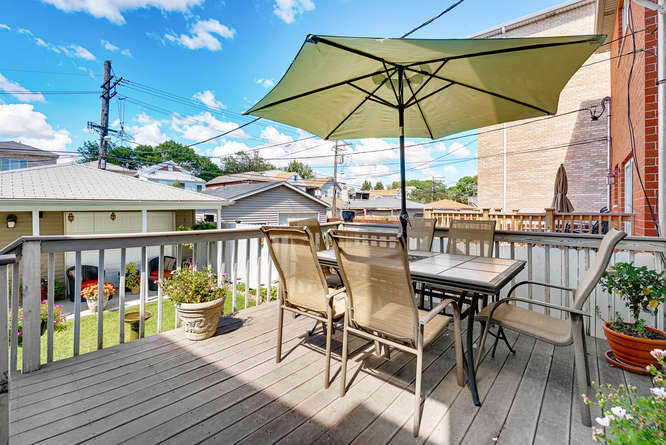 You’ll be able to grill and dine on this large deck during the spring, summer and fall. 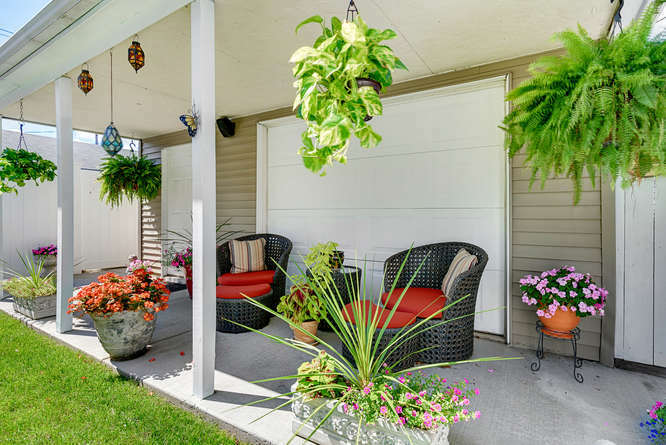 Enjoy the covered patio when you want to relax and have a glass of wine on a warm summer’s night. 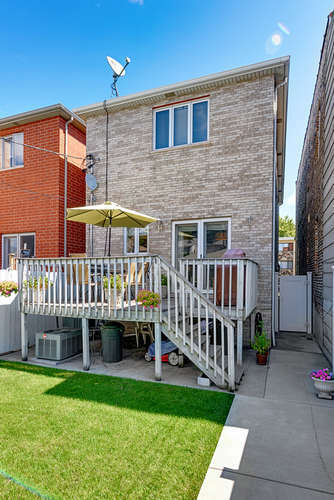 You’ll appreciate the deck and the private yard in this beautifully maintained home.